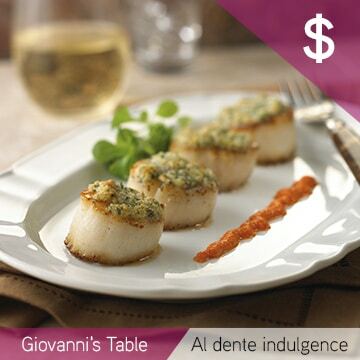 Indulge in rustic Italian dishes served with contemporary flair at Giovanni’s Table, a Royal Caribbean® favorite. 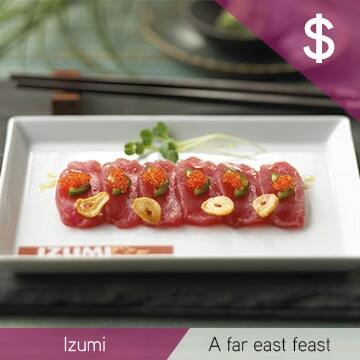 Take a flavor-filled journey to the exotic Far East at Izumi. 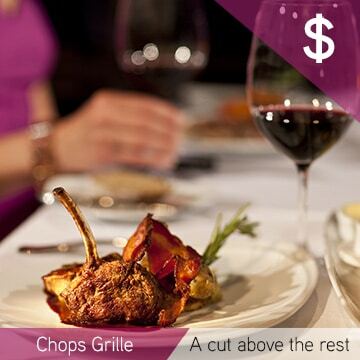 For more than a decade, the chefs of Chops Grille have proudly presented quality, hand cut steaks at this hallmark Royal Caribbean restaurant. 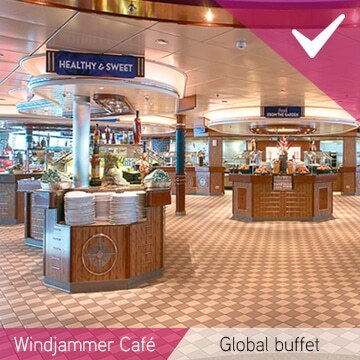 Or embark on a globetrotting gourmet adventure at Windjammer Marketplace. Set sail for delectable, world-class complimentary dining plus classic and avant-garde specialty restaurants— all with satisfying selections for the foodie and the finicky. 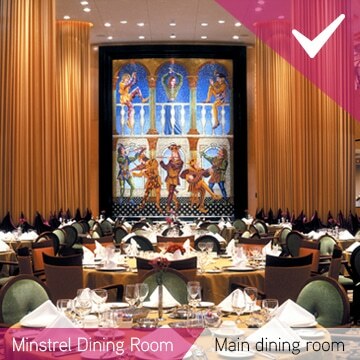 Minstrel the ship's main dining room, spans two decks and has a gushing waterfall as its focal point. The restaurant is open for breakfast, lunch and dinner, and operates on an open-seating plan for breakfast and lunch. RESTRICTIONS: Fully covered shoes and shirts required. For casual deli eats that knock it out of the park, head to the Park Café. You’ll find quick bites to please every palate, from made-to-order salads to fresh-pressed panini and sandwiches. Not to mention the “Kummelweck” roast beef sandwich— it’s a guest favorite. 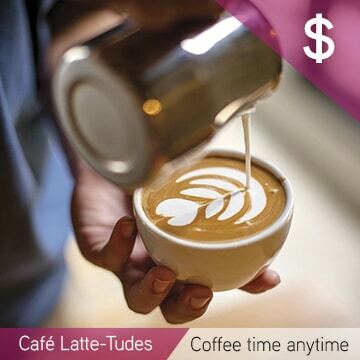 When you find yourself craving a coffee break, Café Latte-tudes has what you need. From a nice breakfast blend to get you going to an after-dinner cappuccino— or even a little pick-me-up and a pastry any time of day— just drop by this café for sweets, specialty coffee beverages, and a bit of people watching. 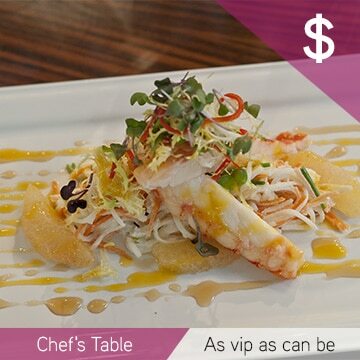 Please note that your Deluxe Beverage package includes items with a value of up to $12 USD. 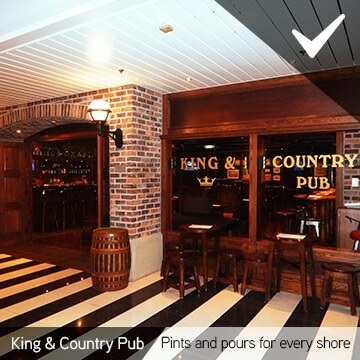 For beverages with a higher value, you will be charged the difference + 18% gratuity. If you need further information regarding the Deluxe Beverage package, please click here. 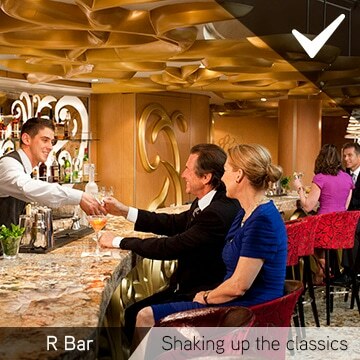 Distinct, sophisticated and retro, R Bar serves up classic cocktails garnished with vintage vibe. Whether your drink of choice is a dry gin martini, an Old Fashioned, or even a specialty drink crafted by the resident mixologist. This is where wine list and to-do list overlap. 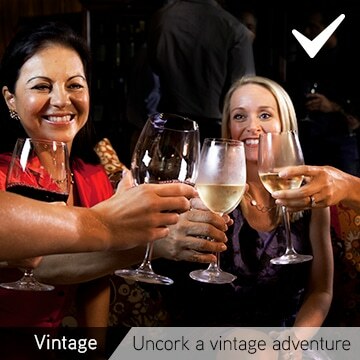 Whether it’s Burgundy, Merlot, Riesling or Pinot Grigio, you’re sure to find your beloved reds or whites at Vintages wine bar. But be bold — try something new and you may return home with a new favorite. From France to California, the wide world of wine is well-represented through extensive partnerships with top winemakers, including some exclusive bottles you won't find anywhere else. As lively as London, this is a brilliant spot to grab a pint. And you’ve got lots to choose from. The impressive beer list runs from ales to lagers, with UK-themed cocktails and an inspired collection of spirits, as well. The outdoor Sky Bar seats 26 guests, and is located directly above the pool bar with steps leading down to the pool deck providing an additional bar for guests using the sports zone to purchase a drink from. 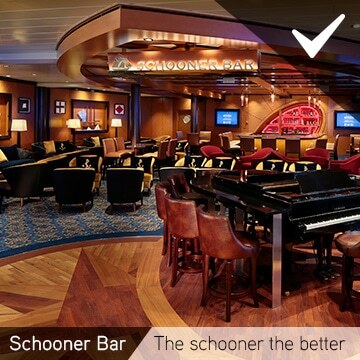 Lying aft, beyond the Schooner Bar, and seating 381 guests, The Colony Club is in the middle of a customizable entertainment space separated into the Jakarta Lounge and Singapore Sling’s all of which are unique and packed with fun. The Colony Club features a colonial theme with potted palms and plantation shutters along with a large inlaid wood dance floor and two bars. At the top of the ship is another Royal Caribbean hallmark feature, the Viking Crown Lounge, projecting out from the ship's funnel. This area is subdivided into the Star Quest Disco with its revolving bar and large dance floor. 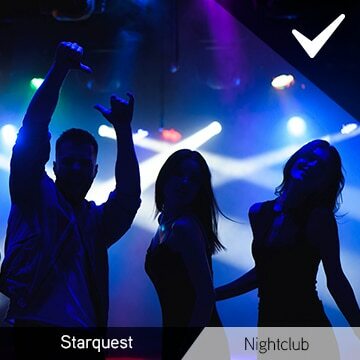 So, if you can't live without Temptation’s signature theme nights and meeting new people, the Starquest Nightclub gladly opens you its doors into a world of endless enjoyment! 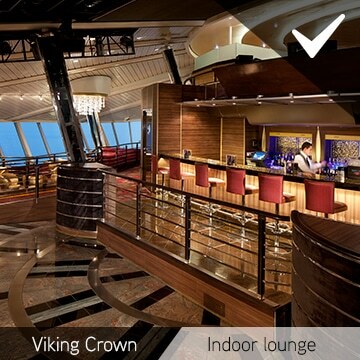 A Royal Caribbean signature and located high above the ocean, the comfortable Viking Crown Lounge offers spectacular vistas by day and turns into a lively dance club at night. 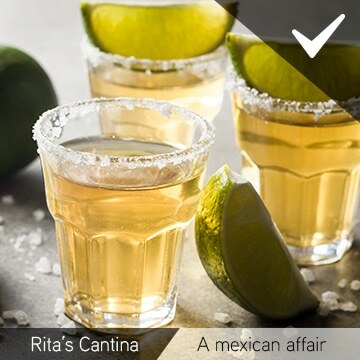 Located near Windjammer, Rita's Cantina serves up a wide selection of creative Mexican margaritas! Loyalty definitely has its privileges. 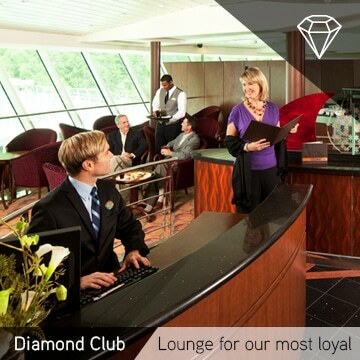 Royal Caribbean® created the exclusive Diamond Club lounge to thank our valued Diamond, Diamond Plus and Pinnacle Club Crown & Anchor® Society members for their continued loyalty. From concierge access to complimentary continental breakfast, and even complimentary cocktails at happy hour, our most loyal guests enjoy special perks in a space reserved just for them. 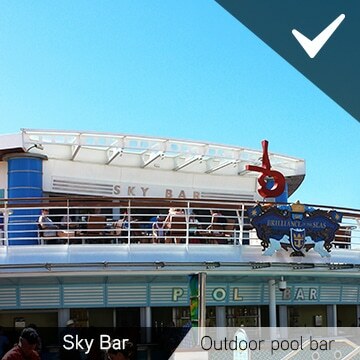 RESTRICTION: For Diamond, Diamond Plus, and Pinnacle Club Crown & Anchor Society members only. Guests reserved in our Suites (excluding Junior Suites) can take advantage of the Concierge Lounge. Concierge Club guests will receive this complimentary service that provides assistance with any special requests they may have while sailing. 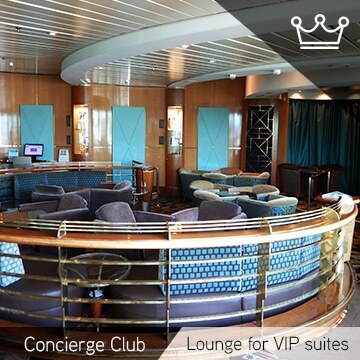 As a Concierge Club guest, you will be offered amenities and services not available to other guests. and from 5:00 pm - 8:30 pm.